Thursday is GURPSDay. And today is very nearly THE GURPSDay, as we’re probably seeing the biggest GURPS news today since the announcement of Fourth Edition in 2004. Below you can find the blog activity from the last seven days. So today is the day. As of roughly 10am, the Dungeon Fantasy RPG Boxed Set Kickstarter has gone live. I also suspect that we might see other DF news, since a smaller but game-changing project will go live soon. Maybe not, but we’ll see. It’s a good day to GURPS. DF Kickstarter Update #2: PDFs of DF files (9/01/16) – SJG adds the ability to get PDFs of the DF Boxed set to the Kickstarter Add-ons. Asked and answered! DF Kickstarter Update #1: A pretty damn important note (9/01/16) – An important note from Phil Reed in Update #1 from the Kickstarter about international shipping, and how you can back the project anyway, showing a vote of support for GURPS. Please read it, and consider backing. Dungeon Fantasy Boxed Set – Q&A with Phil Reed (8/31/16) – Steve Jackson Games’ CEO Phil Reed answers a few of my questions about the recently-announced GURPS Dungeon Fantasy Boxed Set! 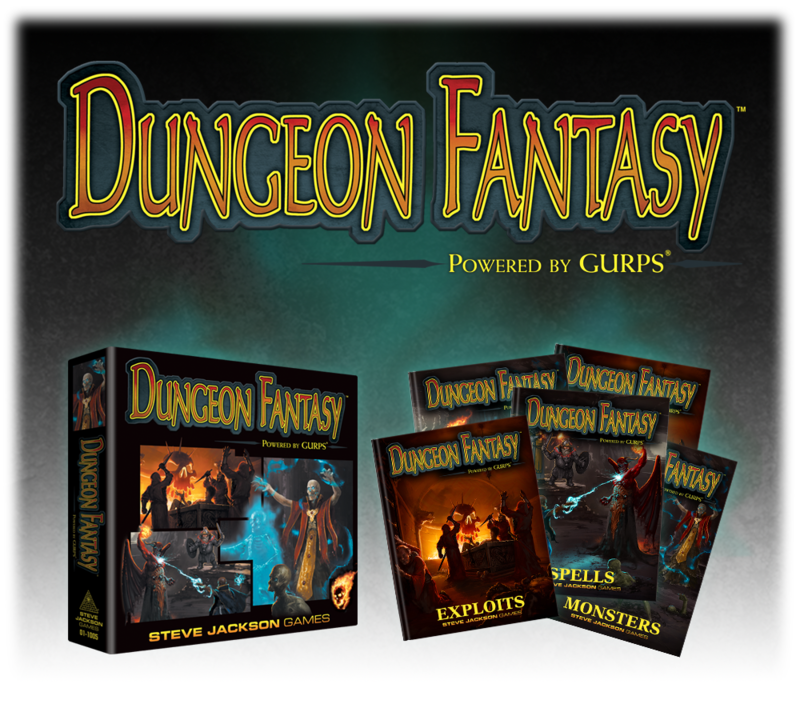 Dungeon Fantasy Boxed Set announced! (8/31/16) – Steve Jackson Games makes a big announcement – a Kickstarter for a five-volume boxed Dungeon Fantasy set with lots of goodies in the box. Ready-to-play, with consolidated and edited content that will invite beginners and please grognards. Also – I’ve got interviews scheduled with Phil Reed and Sean Punch on this topic over the next two weeks. Watch this space! Aeon Campaign S3E7 – Ante-mortem (8/30/16) – In S3E7 of the Aeon campaign, we attend the civilian funeral of a fallen hero off-screen. We then try and figure out how to take the fight back to Blue Skies, and decide to really play the anti-Wheaton card. We get them evicted from their own main headquarters. Upon doing that, we realize that we’ve been penetrated at a high level by a group similar to Anonymous called Sentry. That is interrupted in true pulp fashion by a biker gang with machineguns. They are dealt with efficiently, but a bigger threat is revealed. Sundered Lands 11 (9/01/16) – The newest adventures in the Sundered Lands of Palladium, our GURPS: Palladium Fantasy campaign. Grand Duchy 85 (9/01/16) – The Grey Company does more exploration of the ancient Temple of Pflarr. Remar discovers a new “friend.” Summary of the latest play session of The Grand Duchy of Adventure, our GURPS: Mystara campaign. Dungeon Fantasy RPG Kickstarter! (9/01/16) – A new Powered by GURPS Kickstarter?! OMG YES!!! Magnificent Samurai Session 7 (8/30/16) – The party defeats a character’s sworn foe in a tough battle. Sleepless Nights: Magic House Rules (2 of 2) (8/27/16) – More additions to the standard magic system: magic circles, decanic sigils, and using Thaumatology to add temporary enhancements to spells. Plus applications for Alchemy, Autohypnosis, and more! Sleepless Nights: Magic House Rules (1 of 2) (8/26/16) – Additions to the standard magic system: Temporal mana variations rather than spatial ones, reasons to spend more than 1 point on spells, and Ritual Magic as a versatile supporting skill for spells. What’s the Deal With the Beam Weapons Skill? (9/01/16) – In this weeks GURPS Day post I go over some of my isues with how GURPS handles the Beam Weapons skill and some possible ways to fix it. Noodling about Hyper Dense Armor and Traveller (8/27/16) -A quick little post were I ramble on about how I go through deconstructing how things work in GURPS, Ultra-Techs ties to Traveller and convert some Traveller armor materials into GURPS. Ritual Path Magic: Martial Artist…? (9/01/16) – Can we make RPM run fast enough for a fast paced Martial Artist? I think so! Sorcery: Cadaver Cosmetology (8/31/16) – Make a cadaver look nice for a funeral… or make it look like someone else’s dead body. Editorial: Help Me Help You Make A Character That’s Fun To Play (8/30/16) – Today, I talk about making characters again, and how it should happen in a perfect world and everything went the way I wanted it to go. Ability: Telelocation Inspired by Stranger Things (8/29/16) – What can you do with telecommunication if you can only receive information? Review: Martial Arts (8/28/16) – I find it so fundamental, it is hard for me at this point to think about GURPS without thinking about this book. Review: Pyramid #3/89 – Alternate Dungeons II (8/27/16) – It’s good, but I liked the first one more. Review: Thaumatology – Sorcery (8/26/16) – Funny, for all I talk about the system, I apparently never reviewed the book. Tactical Analysis: Monstrous Conflict (8/31/16) – Not all combat in Psi-Wars will feature human-on-human action. This is sci-fi! So, this article takes a look at how well the standard tactics of the setting will fare against giant space monsters or implacable robots. Rawr! Character Creation Options (8/30/16) – Point buy may be the default way to create GURPS characters, but it’s far from the only option. This post examines several methods for building GURPS characters and explores which mechanism make the most sense for different player and GM needs.